← What if your deer repellent attracts deer? I am constantly amazed at the number of people in Floyd who put service to others above self interest. In this county where there is very little money to spare, there always seems to be people willing to give a helping hand to others. McCabe Coolidge and Karen Day operate Wildfire Pots located under the Sun Music Hall in Floyd. When they are not making pots and creating artwork, they are heavily involved in food programs for school children and help distribute produce to folks who can’t get around very well. I caught them in the midst of preparing produce for distribution. The fresh produce looks delicious in McCabe’s pottery. Actually, we have found that everything looks better in his pottery. The forms are organic and every piece shows the touch of the artists hand. They are open from 11 to 4 on Thursdays, Fridays, and Saturday. If you are in the vicinity of the Sun Music hall, drop in and enjoy their hospitality. 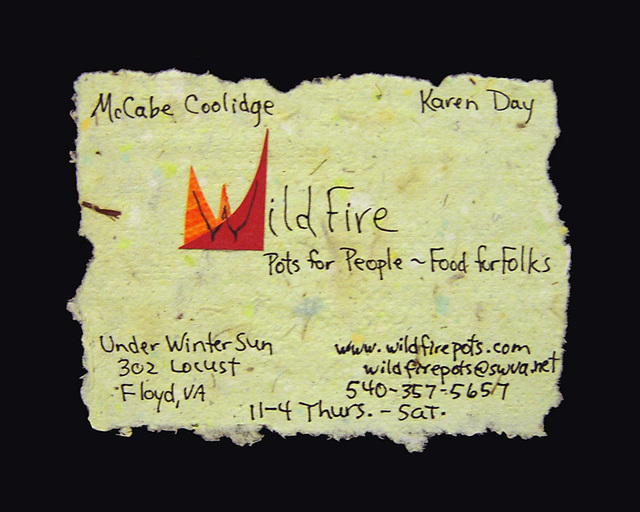 McCabe and Karen have always provided space in their studios to promote other artists. It is just another aspect of their willingness to help others. 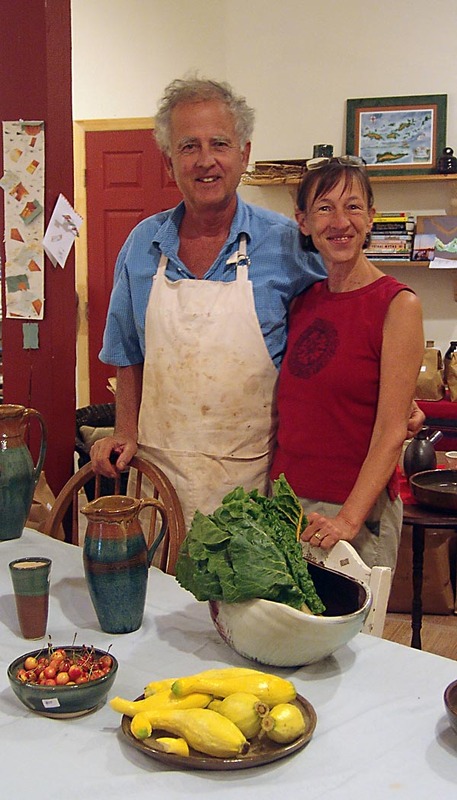 artists such as handcrafted jewelry and the fiber art of Glenda George in addition to McCabes unique pottery. and I felt it should have wider exposure. It tells their story on one small piece of handmade paper. This entry was posted in Floyd Artisans/Craftspeople, Simpler Lifestyle. Bookmark the permalink. We’re lucky to have them in Floyd!